Every board comes with a handmade magnetic flower! Choose from either Flower or Rosette. Extra flowers are $1.50 each! 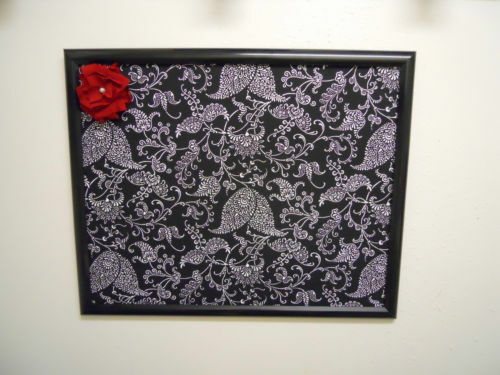 ♥ 10″ x 13″ Paisley Fabric Covered Magnet Board, Framed in Black: $34.99 incl. shipping! or check out my eBay listing here! ♥ 10″ x 13″ Paisley Fabric Covered Magnet Board, Framed in Distressed/Shabby Chic Blue: $34.99 incl. shipping! 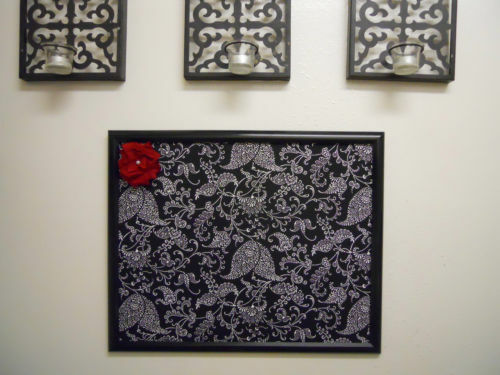 ♥ 16″ x 20″ Paisley Fabric Covered Magnet Board, Framed in Black: $50 incl. shipping!